Please Note : If you would like to receive this Championship Flag without the Frame please contact our customer service immediately upon receiving your order confirmation e-mail. For the first time in history, The Open Championship has allowed for the release of select original and cherished assets used in organising and conducting The Open Championship. 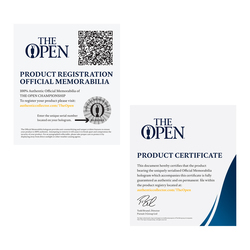 The resulting range of products are being offered to golf fans around the world as Official Memorabilia of The Open Championship. This on-course pin flag, sourced directly from The 147th Open Championship was used on the 16th Hole of Round 3 and is a one-of-a-kind, rare and historical piece of Open Championship history. 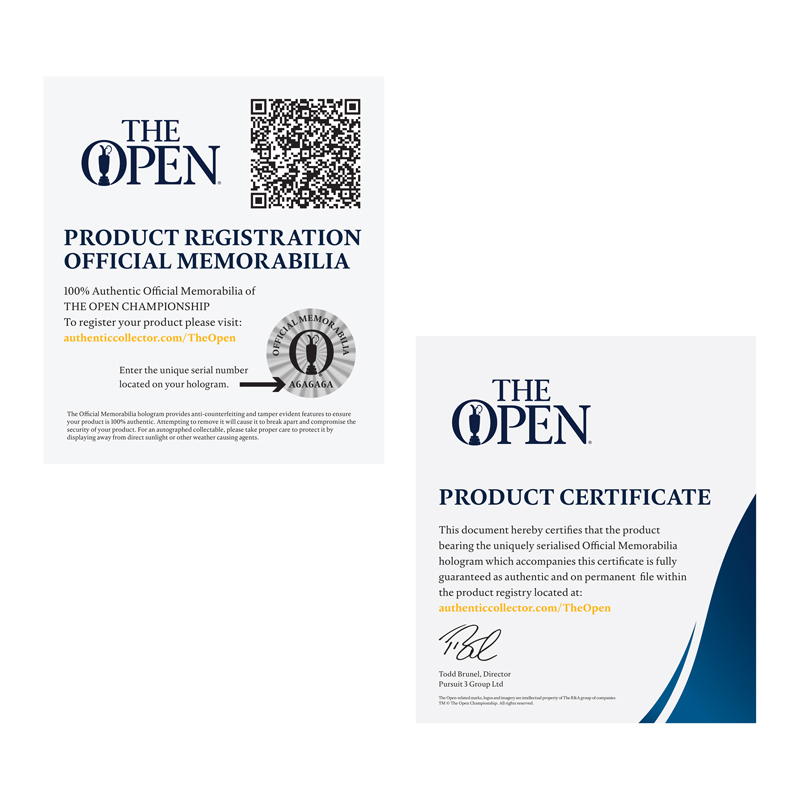 Product includes serialised Official Memorabilia security hologram and Product Guarantee Certificate. Outside Frame Dimensions (Approx.) - 25.5 x 21.5 in. Note: The image shown is meant to communicate a reasonable depiction of the actual item. Placement of bids in this auction constitutes acceptance of The Open Auction rules and terms and conditions. 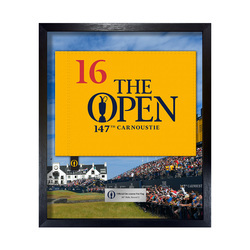 Certain products offered are in anticipation that we will be receiving the item after completion of The Championship, for example an On-course Pin Flag or Locker Room Nameplate. In the event an item for which you have been determined the winner is not available, we will notify you immediately and issue a full refund. Before bidding, please review our full Terms and Conditions of Use, and Terms and Conditions of Sale. Non-Payment will result in the revocation of bidding privileges and cancellation of the Registrant’s account. Please Note: When you place a bid and win an item you are entering into a legally binding contract, promising to pay for your items and any additional fees (VAT, shipping etc.). We ship all products using standard courier services to any worldwide destination. Rates and approximate lead times are provided below. If you have any questions then please contact us at customerservice@theopenauctions.com. Your shipping and handling charges are also summarised at checkout. You will receive a shipping confirmation email with your tracking number. You can also check on your order status or get tracking information by logging into your My Account. Multi item orders may be shipped separately and arrive at different dates. Depending on the type, availability, quantity and weight of items in your order, we may pack and ship them separately to ensure they arrive on time and undamaged. You will never be charged more for shipping and handling than what appears at checkout. Please note that because the memorabilia products offered at the The Open Auction website are made-to-order and customised, you should allow up to 6 weeks to receive your completed order. We do our best to ensure your delivery arrives on time, however, delivery dates are not guaranteed and there may be a number of unforeseen reasons why your items will arrive after the estimated arrival date. Large orders, international customs clearance, credit card authorisation and verification, manufacturing equipment failures, tournament used items still in use, or other unforeseen reasons, may all delay delivery of your order. We go to extreme measures to ensure the protection of your made-to-order item(s) through an extra effort to carefully package and protect your unique product for successful delivery. As a result, our delivery charges may be higher than expected for the reasons stated above. Our products are typically irreplaceable and will be shipped using a courier that will require a signature on delivery. Typically, Shipping and Handling for Auction and Buy Now items to UK addresses range from £20.00 to £35.00 depending on the total weight and dimensions of your order, however, there can be exceptions for bulkier items. Although we will always endeavor to ship your product as soon as possible, please allow up to 6 weeks for delivery for Auction and Buy Now items. If you have any questions about delivery timeline and/or charges within the UK, please contact us at customerservice@theopenauctions.com. All Auction items are subject to an additional 20% VAT for UK shipping addresses that will be added to the order at time of checkout. All Buy Now items include VAT in the retail price. Please note due to security and accessibility items cannot be picked up. Shipping and Handling for Auction and Buy Now items to EU can vary by country, total weight and dimensions of your order. Although we will always endeavor to ship your product as soon as possible, please allow 6-8 weeks for delivery for Auction and Buy Now items. If you have any questions about delivery timelines and/or charges within the EU, please contact us at customerservice@theopenauctions.com. All Auction items are subject to an additional 20% VAT for EU shipping addresses that will be added to the order at time of checkout. All Buy Now items include VAT in the retail price. Shipping and Handling for Auction and Buy Now items to EU can vary by country, total weight and dimensions of your order. Although we will always endeavor to ship your product as soon as possible, please allow 6 to 8 weeks for delivery for Auction and Buy Now items. If you have any questions about delivery timelines and/or charges outside of the UK and EU, please contact us at customerservice@theopenauctions.com. All International customers are responsible to pay for all applicable duty and customs charges for international deliveries. Charges for duties, taxes and the carrier's collection fee are in addition to your shipping charge and must be incurred by you. You should contact your local customs office for further information. All Buy Now items include VAT in the retail price. In some auctions, a number of identical items are offered for sale at the same time. When the listing closes, the highest Bidders win the available inventory. Bids are sorted in order with priority given to price, the quantity bid for, and then finally to time a bid was placed. The time of a bid is determined by Hertz.com based on its records. If bids are tied for price, the Buyer who has bid in the greater quantity wins. If there are two bids at the same price for the same quantity, the early bid wins. Now it’s even easier to bid on The The Open Auctions. When you see an auction labeled for SMS Bidding, just send the SMS Reference ID and your bid amount to the number given, separated by a semicolon(;). THE OPEN RELATED MARKS, LOGOS AND IMAGERY ARE INTELLECTUAL PROPERTY OF THE R&A GROUP OF COMPANIES TM © THE OPEN CHAMPIONSHIPS. ALL RIGHTS RESERVED.